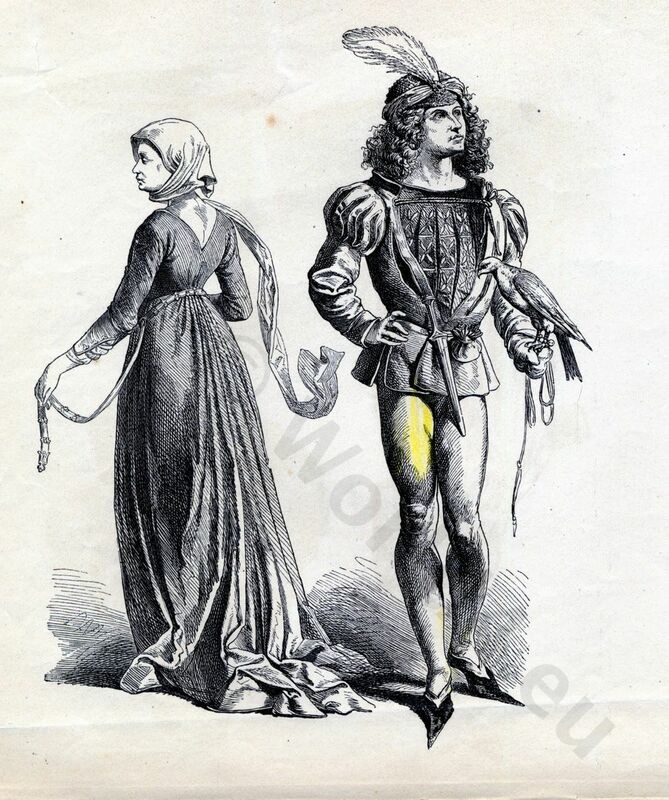 Home » French fashion in 1480. The clothing in this period reflects more on the very style of the Burgundian fashion. The man in poulaines, very short skirts, tight trousers. The jacket with slit sleeves, padded. The emphasis is on the broad chest, shoulders. The head is increased by a hat with a feather. Long hair is in fashion. In this figure, a noble man cares of falconry. The pointed shoes even have a moderate size, which in those times was the exception, as the various dress codes of those times documented. This entry was posted in 1480, 15th Century, Burgundian dress, France, Middle Ages, Renaissance and tagged Burgundian fashion period, Medieval costume, Renaissance fashion era on 4/12/13 by world4.